So yesterday, I was browsing through my Facebook when I’ve came across this article. It was an article about Calvin, and how he is shaped by the loneliness he felt. While I didn’t agree with every point made in the article, I do agree that Calvin is lonely because he say the world differently from his peers. 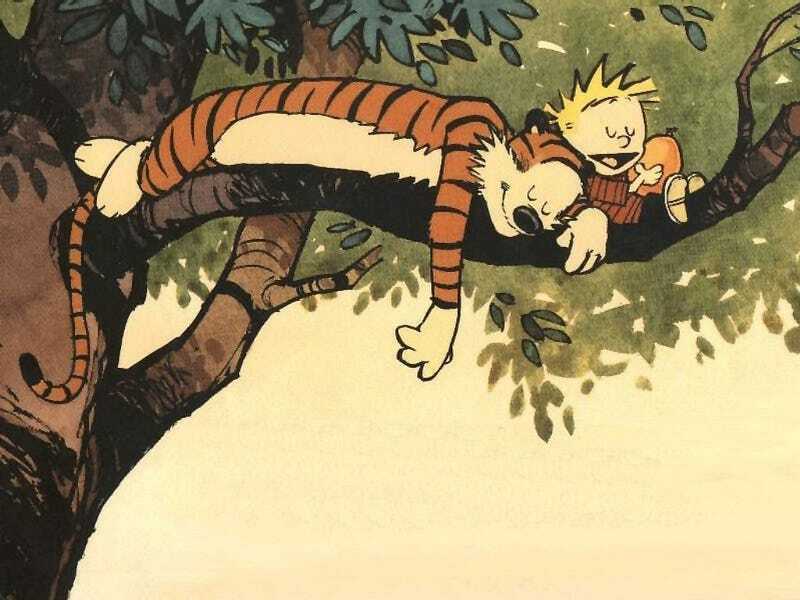 I’ve picked up Calvin and Hobbes when I was about 7, and instantly fell in love with the comic because it resonated with me on a personal level. From being bullied to the questions I had about the world. At an early age, I’ve already realize how absurd the world can be, and always had trouble fitting in. But lucky for me, there were other misfits that I befriend (which may have resulted in me being a bit further isolated by peers). And even when things felt pointless, Calvin and Hobbes never failed to put a smile on my face because it gave a little hope. (Also, I’m pretty sure Calvin’s dad is the number 1 reason why I developed a sarcastic sense of humor, and temper by the internet). Tonight’s topic: Something you’ve turned to when no one is there, and things got rough.